There is insufficient data on the practice and the repercussions of early childhood marriage (ECM) in Iran. Social Anthropologist Kameel Ahmady, recipient of the 2017 Truth Honour Award by the London Law School and the IKWR Women’s Rights Organisation, exposes the ugly truth about ECM in Iran in this ground-breaking research study. Unflinching in its candour, An Echo of Silence is a frank examination of an unspoken subject on the staggering number of children who are married off in Iran. Kameel Ahmady is a British-Iranian social anthropologist who has worked mainly on international development. Following the success of Female Genital Mutilation In Iran (A Country Size Research Report and Book), which had taken ten years to comprise, the new study of An Echo of Silence is the result of a painstaking and detailed comprehensive field survey of ECM in seven provinces of Iran. 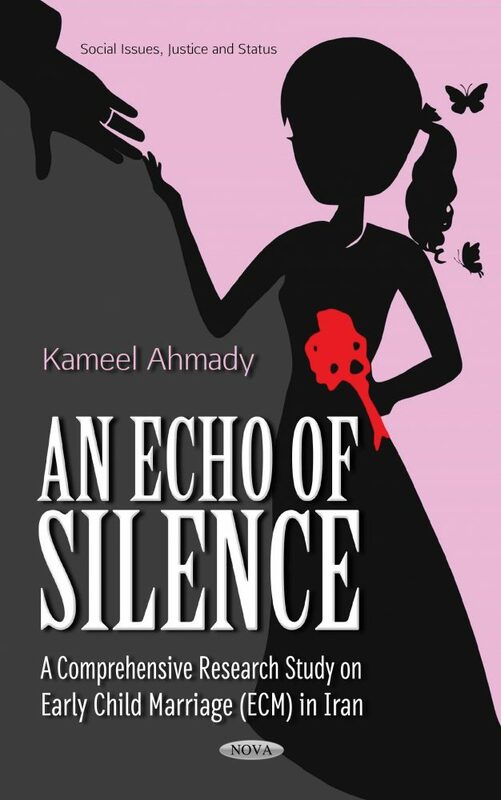 An Echo of Silence provides a descriptive overview of ECM and its vicious impact by conceptually analysing the issues of young brides who have been forced into marriage. The book also unflinchingly describes the Iranian government’s failure to address this tragic system where young boys and girls are married off routinely. An Echo of Silence is a provocative book about a hallowed cultural institution cloaked in non-acknowledgement. Kameel Ahmady gives the reader an unprecedented look into the world of ECM in Iran by focusing on the multiplicity of various complexes and prominent socio-cultural factors that contribute to and mirror this deep-rooted tradition, including the social attitudes and silent acquiescence of the Iranian government which influences its perpetuation. The silence is shattered by the observational scanning on marital customs and norms within the seven main provinces, and interviews with the families and the children themselves as they carry on with the tradition. The research study dissects the rationales for ECM’s continual existence and adherence by probing the various causes and entailing consequences of ECM. This study acts as a voice for the silent and is a must-read. Audience: General readers, Social Elites, Universities and students, researchers and people with interest in Middle East, feminists and activist groups, research centers, human right groups, international NGOs, UN, UNICEF and UNAFPA are the audience of this message. Other non-professionals and interested readers might also benefit from knowledge-raising efforts of this book.